For other people named James Murdoch, see James Murdoch (disambiguation). James Rupert Jacob Murdoch (born 13 December 1972) is a British-Australian businessman, the younger son of media mogul Rupert Murdoch, the former chief executive officer (CEO) of 21st Century Fox. He is the former chairman and CEO of News Corp and Sky plc, Europe and Asia, where he oversaw assets such as News International (British newspapers), publisher of The News of the World newspaper, SKY Italia (satellite television in Italy), Sky Deutschland, and STAR TV (satellite television in Asia). He sits on the News Corporation board of directors and is a member of the office of the chairman. He was made executive chairman of News International in December 2007 He has since resigned from the post. He previously held a non-executive chair at British Sky Broadcasting, in which News Corporation has a controlling minority stake. In April 2012, he was forced to resign as chairman of BSkyB in the wake of the ongoing phone hacking scandal, in which he was implicated. He was reappointed chairman of the company following its merger with its Italian and German sister companies to form Sky plc. He was formerly an executive vice-president of News Corporation, the controlling shareholder of BSkyB, and served on the board of directors of News Datacom and of News Corporation. In May 2012, a highly critical UK Parliamentary report said that Murdoch "showed wilful ignorance of the extent of phone-hacking" and found him "guilty of an astonishing lack of curiosity" over the issue. It went on to say that both Murdoch and his father, Rupert, 'should ultimately be prepared to take responsibility' for wrongdoing at the News of the World and News International. Murdoch is a British citizen by birth and a naturalised US citizen. He lost Australian citizenship when his father became a US citizen, but he is eligible to reclaim it. Murdoch was born in Wimbledon, London, England. He is the fourth of billionaire media mogul Rupert Murdoch's six children, and the third with Scottish-born journalist and author Anna Murdoch Mann. As a youngster James was regarded as the brightest of the Murdoch children, but also considered something of a rebel. He first came to public notice as a 15-year-old intern at the Sydney Daily Mirror but made headlines in the rival The Sydney Morning Herald after he was photographed asleep on a sofa at a press conference. Murdoch attended Horace Mann School in New York City and graduated in 1991. He then studied film and history at Harvard University, where he was a member of the Harvard Lampoon. He dropped out of university in 1995 without completing his studies. With university friends Brian Brater and Jarret Myer, he backed the establishment of Rawkus Records, an independent hip hop record label. The company was bought by News Corporation in 1998. In 1996 Murdoch joined News Corporation and was appointed chairman of Festival Records. He took charge of News Corporation's internet operations, where he invested in a series of ventures, including financial website TheStreet and the short-lived online music site Whammo, with mixed results. He also continued to contribute cartoons to US magazine Gear. He is credited with sparking his father's interest in the internet, and he reportedly tried to persuade his father to buy internet company Pointcast for US$450million. It was subsequently sold to another company for $7 million. After installing a new management team at Festival, Murdoch purchased the controlling 51% share of Mushroom Records in 1999, and the merged group was rebranded as Festival Mushroom Records. It was at first thought that News might use FMR as the foundation of a new international entertainment company, but Festival struggled while Murdoch was in charge and after his departure its fortunes declined rapidly; the company was wound up in late 2005 and its remaining assets were sold. The recording catalogue was sold to the Australian division of Warner Music for only A$10 million in October 2005, and the publishing division was sold to Michael Gudinski a month later, for an undisclosed sum. In May 2000, Murdoch was appointed chairman and chief executive of News Corporation's ailing Asian satellite service Star Television, which at the time was losing £100m a year, and he moved to Hong Kong. In February 2003, Murdoch became a director of BSkyB. Later that year, he controversially became CEO of BSkyB, in which News Corporation owns a controlling minority stake. 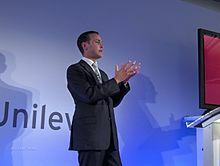 His appointment sparked accusations of nepotism, with some commentators and shareholders feeling that the job had not been opened to outsiders and that Murdoch was too young and inexperienced to run one of the UK's top companies (on appointment he was by far the youngest chief executive of a FTSE 100 company). Following the shock resignation of his brother Lachlan Murdoch from his executive positions at News Corporation on 29 July 2005, James is widely viewed as his father's heir-apparent. On 7 December 2007, Murdoch stepped down as CEO from BSkyB and was appointed non-executive chairman of the company (a position formerly held by his father, Rupert). In a related announcement, Murdoch also took "direct responsibility for the strategic and operational development of News Corporation's television, newspaper, and related digital assets in Europe, Asia, and the Middle East." This included holdings such as News International, SKY Italia, STAR Group ltd and possibly other News Corp. related assets. He was based at News International's headquarters in Wapping, East London. In February 2009, Murdoch was appointed a non-executive director with the British pharmaceutical company GlaxoSmithKline. In August 2009, Murdoch delivered the MacTaggart Memorial Lecture at the Edinburgh International Television Festival, in which he attacked the BBC and UK media regulator Ofcom calling the BBC's expansion "chilling" and "In this all-media marketplace, the expansion of state-sponsored journalism is a threat to the plurality and independence of news provision, which are so important for our democracy." The BBC chairman, Sir Michael Lyons officially responded, "We have to be careful not to reduce the whole of broadcasting to some simple economic transactions. The BBC's public purposes stress the importance of the well-tested principles of educating and informing, and an impartial contribution to debate in the UK." In April 2010, Murdoch and his associate Rebekah Brooks stormed into the offices of The Independent to complain about an advertisement campaign by the newspaper. The advertisement read, "Rupert Murdoch won't decide this election—you will." In April 2014, it was announced that Murdoch would join the board of advertising start-up True[X] Media. In June 2015, his father, Rupert announced he would be leaving his position as CEO of 21st Century Fox and James will take over the position in the near future. In January 2016, Murdoch became the chairman of Sky, Britain's subscription broadcaster. On October 8, 2018 Murdoch left Sky after Comcast took the majority control of the company. 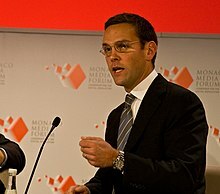 On 7 July 2011, James Murdoch announced the closure of the British tabloid newspaper the News of the World in the wake of a phone hacking scandal. On 19 July 2011, along with his father, Rupert, he appeared at a hearing of the Commons Culture, Media and Sport Committee. He appeared once again before the same committee on 10 November 2011. James maintained that until late in 2010 he was unaware that more than one "rogue reporter" from the News of the World tabloid had been involved in phone hacking. This statement was challenged by the formal legal manager and editor for the newspaper, who claimed they had informed James of the "Transcript for Neville" email, a potential "smoking gun" indicating several of the newspaper's journalists may have been involved, during the settlement negotiations with Gorden Taylor in 2008 and alerted him to the potential liability if this document became public. On 22 July 2011, Britain's prime minister, David Cameron, said that Murdoch has "questions to answer in Parliament," a day after former top executives of the News of the World accused the News Corporation executive of giving "mistaken" evidence. In November 2011, British newspapers reported that Murdoch had resigned as chairman of News Group Newspapers, the holding company above The Sun, News of the World and Times Newspapers Ltd, itself owner of The Times and The Sunday Times. News Group Newspapers is the company subject to a series of lawsuits, all related to the phone hacking scandal. James Murdoch's resignation was also said to be related to the 12 October 2011 resignation[clarification needed] of another Dow Jones executive, Andrew Langhoff, after a company whistleblower revealed an editorial scam and questionable circulation dealings at The Wall Street Journal Europe. In February 2012, News Corp announced that Murdoch would be stepping down as executive chairman of its British newspaper arm. The company said he would remain deputy chief operating officer of News Corp and focus on the company's international TV business, including continued responsibility for BSkyB. He stepped down also from the GlaxoSmithKline board. In April 2012, he stood down as chairman of BSkyB, but remained on the board. He was replaced as chairman by Nicholas Ferguson. In September 2012 Murdoch was criticised by the British Office of Communications (Ofcom), which concluded that he "repeatedly fell short of the conduct to be expected of as a chief executive and chairman" and that his lack of action in relation to phone hacking was "difficult to comprehend and ill-judged". Murdoch was married in 2000 and has three children, Anneka (born 2003), Walter (born 2006), and Emerson (born 2008), with his American wife Kathryn Hufschmid Murdoch. Kathryn works for the Clinton Climate Initiative, a charitable foundation set up by the former U.S. President, Bill Clinton in 2006. In 2013, they launched Quadrivium Foundation. Murdoch was instrumental in the formation of Sky Procycling and is a keen cyclist himself. He has a black belt in karate. Murdoch donated money to the Clinton Foundation, the nonprofit organization run by Chelsea, Bill and Hillary Clinton. ^ "James Murdoch: has the heir apparent changed more than his look?". The Guardian. 29 January 2016. ^ Robinson, James (9 December 2007). "Triumph of the family man" – via The Guardian. ^ a b c d e f g h i "James Murdoch: A chip off the old block?". BBC News. 4 November 2003. Retrieved 6 March 2007. ^ "What does the Select Committee report mean for Murdoch's empire?". ^ a b Robinson, James (9 December 2007). "Triumph of the family man". The Observer. London. Retrieved 9 December 2007. ^ "MICHAEL GUDINSKI AM". Retrieved 18 April 2014. ^ Bell, Emily (5 November 2003). "Rupert and the joys of nepotism". The Guardian. London. Retrieved 6 March 2007. ^ Peston, Robert (7 December 2007). "Murdoch son gets key media role". BBC News. Retrieved 5 May 2010. ^ "News Corporation Announces Intent to Pursue Separation of Businesses to Enhance Strategic Alignment and Increase Operational Flexibility – News Corp". ^ Tryhorn, Chris (2 February 2009). "James Murdoch takes GlaxoSmithKline role". The Guardian. London. Retrieved 5 May 2010. ^ Murdoch's Son: BBC Expansion Is "Chilling," A Threat To Independent Journalism. The Huffington Post. 29 August 2009. ^ White, Michael (22 April 2010). "Murdoch-Wade posse crash Independent's office – that's pretty uncool, isn't it?". The Guardian. London. Retrieved 8 September 2010. ^ Gelles, David (16 April 2014). "James Murdoch Joins Board of Advertising Start-Up". The New York Times. Retrieved 18 April 2014. ^ Faber, David (11 June 2015). "Murdoch prepping to step down from 21st Century Fox". ^ Ahmed, Kamal. "James Murdoch takes over at Sky". BBC News. Retrieved 29 January 2016. ^ "Tesla Welcomes Linda Johnson Rice and James Murdoch as New Independent Directors to its Board". Retrieved 20 July 2017. ^ Owen, Paul (7 July 2011). "News of the World to close on Sunday – live coverage | guardian.co.uk". The Guardian. UK. Retrieved 7 July 2011. ^ "James and Rupert Murdoch at the Culture, Media and Sport Select Committee – full transcript". The Guardian. 19 July 2011. Archived from and Rupert Murdoch at the Culture, Media and Sport Select Committee – full transcript the original Check |url= value (help) on 25 July 2013. Retrieved 26 September 2012. ^ "Cameron says James Murdoch has questions to answer in Parliament". US: CNN. 22 July 2011. Retrieved 22 July 2011. ^ "Publisher of WSJ Europe Resigns After Ethics Inquiry". WSJ edition. US. 12 October 2011. ^ Davies, Nick (12 October 2011). "Wall Street Journal circulation scam claims senior Murdoch executive". The Guardian. UK. Retrieved 12 October 2011. ^ "James Murdoch resigns from News International", The Associated Press via CBCnews, 29 February 2012. Retrieved 29 February 2012. ^ Sabbagh, Dan, "James Murdoch resigns as News International chairman", The Guardian, 29 February 2012. Retrieved 29 February 2012. ^ Werdiger, Julia, and Alan Cowell, "James Murdoch Gives Up Role at British Unit", The New York Times, 29 February 2012. Retrieved 29 February 2012. ^ O'Carroll, Lisa and Lizzy Davies (20 September 2012). "Sky ruled fit for broadcast licence, but James Murdoch comes in for criticism". The Guardian. Retrieved 23 September 2012. ^ Knox, Malcolm (November 2009). "RISING SON". The Monthly. Retrieved 27 July 2014. ^ Wilkinson, Peter; Neild, Barry (29 November 2012). "James Murdoch: Son of the Sun king". CNN. Retrieved 27 July 2014. ^ "Clinton Foundation donors include dozens of media organizations, individuals" Politico. May 15, 2015. "James Murdoch collected news and commentary". The Guardian. "James Murdoch collected news and commentary". The New York Times.